Rossis Hochzeits-Blog > Awards > EPIC NIGHT SHOT ACTION – EXPLAINED! Read here how i did it! Today i´m writing in english, as a lot of foreign photographers asked me about this shot and how i did it and so i want to give all the non-german speakers the possibility to understand & read this. 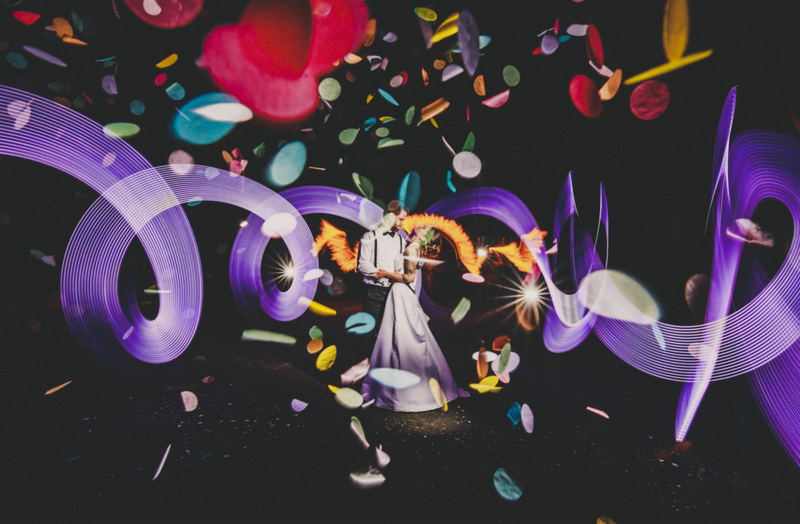 So finally on July 14th i had the chance to realize a very certain idea, which was flying around in my head since our wedding photographers meet-up back then in January 2018, where we did some crazy night shot action for the first time. Sparkles, a „light saber“ and a lot of flashes were involved! And as this was so much fun, finally, finally, now was the time to do this on a real wedding!! So as the reportage was almost wrapped, i asked my couple from last Saturday, if they would like to do some really crazy night shot action! And hell yeah, this was a lot of fun!! So now here´s how i did it, as detailed described as possible! Then, first things first: it has to be almost totally dark! No light from light sources around wanted!! This shot was done late at night on a simple football ground far away enough from the location, so no light spill from street lamps etc. was reaching the spot. 4. Also: setting 2nd flash B ready to fire (manually!! ), also with grid attached, flash power at full!! As the aperture is closed totally, you really need a lot of light to pop the couple out of the darkness! I keep this flash in my hand when the shutter opens so i immediately can start. 5. Posing couple & focusing with live-view. 6. Starting exposure by infrared remote control: 3… 2… 1… GO!!! 9. I am running towards the couple, flashing flash B with grid attached at full power & 35mm flash zoom directly from a short distance a couple of times to the couples head & bodies, from left, right and so on. Also totally free to variate. For example you can only concentrate in the faces, but i wanted the couple to be seen in total. Important is that the couple DOESN´T MOVE! They really have to stay STILL! 10. After that quickly running behind the couple flashing the same flash a couple of times from behind the couple towards the lens (this can create super-awesome flares when it´s raining by the way… and: you can even simulate rain by yourself when you just sparkle water right in front of the lens… the possibilities to expand this with even more layers is endless…). Enjoy & read you soon!